Trinidad and Tobago literature has its roots in oral storytelling among African slaves, the European literary roots of the French creoles and in the religious and folk tales of the Indian indentured immigrants. 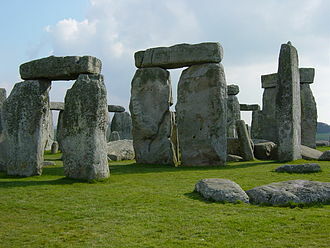 It blossomed in the 20th century with the writings of C.L.R. James, V.S. 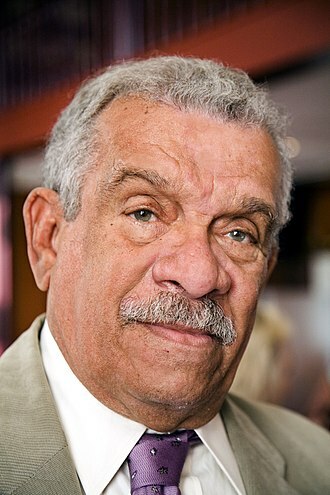 Naipaul and Saint Lucian-born Derek Walcott as part of the growth of West Indian literature. One of the earliest works in the Anglophone Caribbean literature was Jean-Baptiste Philippe's 1824 work, Free Mulatto. Michel Maxwell Philip's 1854 work, Emmanuel Appadocca: A Tale of the Boucaneers, is considered[by whom?] the country's first novel. ^ Gerard Besson, "J.B. Philippe", The Caribbean History Archives, Paria Publishing Co. Ltd, 10 August 2011. Selwyn Cudjoe, "Literature and National Development", trinicenter.com, 21 June 2004. Selwyn Cudjoe, "Identity and Caribbean Literature", trinicenter.com, 24 June 2001. This article about literature from a country or region is a stub. You can help Wikipedia by expanding it. Holi is a Hindu spring festival celebrated in India and Nepal, known as the festival of colours or the festival of love. It is celebrated as a thanksgiving for a good harvest, the first evening is known as Holika Dahan or Chhoti Holi and the following day as Holi, Rangwali Holi, Dhulandi, or Phagwah. Holi is an ancient Hindu religious festival which has become popular with non-Hindus in many parts of South Asia, in recent years the festival has spread to parts of Europe and North America as a spring celebration of love and colours. 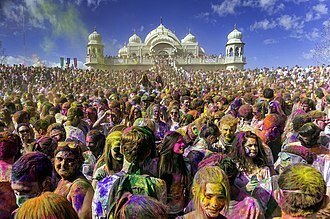 The next morning is celebrated as Rangwali Holi – a free-for-all festival of colours, water guns and water-filled balloons are used to play and colour each other. Anyone and everyone is fair game, friend or stranger, rich or poor, man or woman, the frolic and fight with colours occurs in the open streets, open parks, outside temples and buildings. Groups carry drums and other instruments, go from place to place, sing. 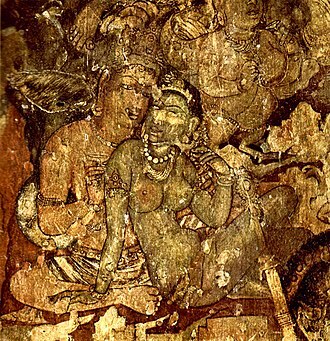 People visit family and foes to throw coloured powders on each other and gossip, share Holi delicacies, some customary drinks include bhang, which is intoxicating. In the evening, after sobering up, people dress up and visit friends, there is a symbolic legend to explain why Holi is celebrated as a festival of colours in the honor of Hindu god Vishnu and his follower Prahlada. 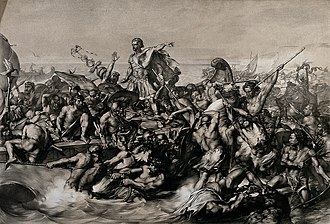 Hiranyakashipu grew arrogant, thought he was God, and demanded that everyone worship only him, hiranyakashipus own son, however, disagreed. He was and remained devoted to Vishnu and he subjected Prahlada to cruel punishments, none of which affected the boy or his resolve to do what he thought was right. Finally, Prahladas evil aunt, tricked him into sitting on a pyre with her, Holika was wearing a cloak that made her immune to injury from fire, while Prahlada was not. As the fire roared, the cloak flew from Holika and encased Prahlada, the Holika bonfire and Holi signifies the celebration of the symbolic victory of good over evil, of Prahlada over Hiranyakashipu, and of the fire that burned Holika. In the Braj region of India, where the Hindu deity Krishna grew up, the festivities officially usher in spring, with Holi celebrated as a festival of love. Sir Vidiadhar Surajprasad Naipaul, TC, is a Nobel Prize-winning British writer who was born in Trinidad. He is known for his early novels set in Trinidad and Tobago, his bleaker novels of the wider world. He has published more than thirty books, both of fiction and nonfiction, over fifty years. V. S. Naipaul, familiarly Vidia Naipaul, was born on 17 August 1932 in Chaguanas in Trinidad and he was the second child of his mother Droapatie and father Seepersad Naipaul. In the 1880s, his grandparents emigrated from India to work as farm labourers, in the Indian immigrant community in Trinidad, Naipauls father became an English-language journalist, and in 1929 began contributing articles to the Trinidad Guardian. In 1932, the year Naipaul was born, his father joined the staff as the Chaguanas correspondent, in A prologue to an autobiography, Naipaul describes how his fathers reverence for writers and for the writing life spawned his own dreams and aspirations to become a writer. The Naipauls believed themselves to be the descendants of Hindu Brahmins, though they did not observe many of the practices, the family gradually stopped speaking Indian languages and spoke English at home. Upon graduation, Naipaul won a Trinidad Government scholarship that allowed him to study at any institution of learning in the British Commonwealth. At Oxford, Naipauls early attempts at writing, he felt, were contrived and unsure of his ability and calling, he became depressed. In April 1952, he took a trip to Spain. He called his impulsive trip a nervous breakdown, thirty years later, he called it something like a mental illness. In 1952, before visiting Spain, Naipaul met Patricia Ann Hale, his future wife, with Hales support, he began to recover and gradually to write. She became a partner in planning his career and her family was hostile to the relationship, his was unenthusiastic. In June 1953, Naipaul and Hale graduated from Oxford and he worked at odd jobs and borrowed money from Pat and his family in Trinidad. Naipaul moved to London in 1954, in December of that year, Henry Swanzy, the producer of a BBC weekly programme called Caribbean Voices, hired Naipaul as presenter. 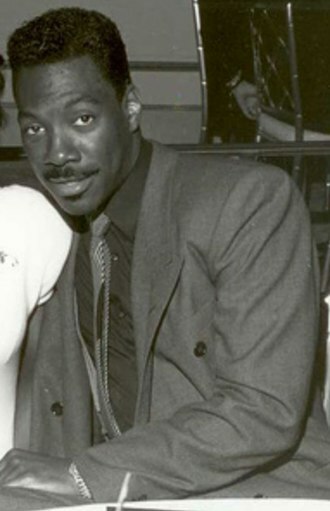 A generation of Caribbean writers had debuted on Caribbean Voices, including George Lamming, Samuel Selvon, Derek Walcott, Naipaul stayed in the part-time job for four years. Diwali or Deepavali is the Hindu festival of lights celebrated every year in autumn in the northern hemisphere. It is a holiday in Fiji, India, Mauritius, Nepal, Sri Lanka, Suriname and Tobago. One of the most popular festivals of Hinduism, it signifies the victory of light over darkness, good over evil, knowledge over ignorance. Its celebration includes millions of lights shining on housetops, outside doors and windows, around temples, in the Gregorian calendar, Diwali night falls between mid-October and mid-November. Before Diwali night, people clean and decorate their homes and offices, after puja, fireworks follow, a family feast including mithai, and an exchange of gifts between family members and close friends. Deepavali marks a major shopping period in nations where it is celebrated, the name of festive days as well as the rituals of Diwali vary significantly among Hindus, based on the region of India. Dhanteras usually falls eighteen days after Dussehra, Diwali or Sanskrit dīpāvali means series of lights, and is derived from dīpam light and oli glow of light. Diwali is known as festival of lights. Diwali dates back to ancient times in India, as a festival after the summer harvest in the Hindu calendar month of Kartika. The diyas are mentioned in Skanda Purana to symbolically represent parts of sun, the giver of light and energy to all life. Hindus in some regions of India associate Diwali with the legend of Yama, the Nachiketa story about right versus wrong, true wealth versus transient wealth, knowledge versus ignorance is recorded in Katha Upanishad composed in 1st millennium BC. King Harsha in the 7th century Sanskrit play Nagananda mentions Deepavali as Deepapratipadutsava, the Persian traveller and historian Al Biruni, in his 11th century memoir on India, wrote of Deepavali being celebrated by Hindus on New Moon day of the month of Kartika. Diwali is one of the happiest holidays in India and Nepal with significant preparations, people clean their homes and decorate them for the festivities. People buy gifts for family members and friends which typically include sweets, dry fruits and it is the period when children hear ancient stories, legends about battles between good and evil or light and darkness from their parents and elders. Saint Lucia is a sovereign island country in the eastern Caribbean Sea on the boundary with the Atlantic Ocean. Part of the Lesser Antilles, it is located north/northeast of the island of Saint Vincent, northwest of Barbados and it covers a land area of 617 km2 and reported a population of 165,595 in the 2010 census. The French were the islands first European settlers and they signed a treaty with the native Carib Indians in 1660. 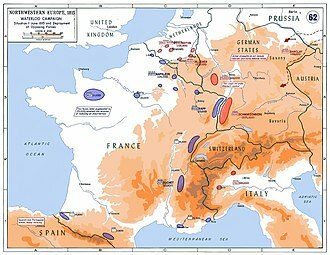 England took control of the island from 1663 to 1667, in ensuing years, it was at war with France 14 times, and rule of the island changed frequently. In 1814, the British took definitive control of the island, because it switched so often between British and French control, Saint Lucia was known as the Helen of the West Indies. 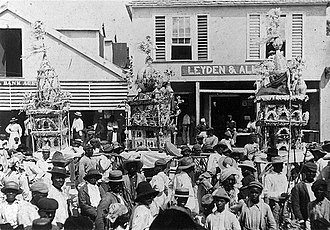 Representative government came about in 1840, from 1958 to 1962, the island was a member of the Federation of the West Indies. On 22 February 1979, Saint Lucia became an independent state of the Commonwealth of Nations associated with the United Kingdom, Saint Lucia is a mixed jurisdiction, meaning that it has a legal system based in part on both the civil law and English common law. The Civil Code of St. Lucia of 1867 was based on the Quebec Civil Code of 1866 and it is a member of La Francophonie. One of the Windward Islands, Saint Lucia was named after Saint Lucy of Syracuse by the French, the islands first European settlers, the French pirate François le Clerc frequently visited Saint Lucia in the 1550s. It was not until around 1600 that the first European camp was started by the Dutch at what is now Vieux Fort, in 1605 an English vessel called the Olive Branch was blown off-course on its way to Guyana, and the 67 colonists started a settlement on Saint Lucia. 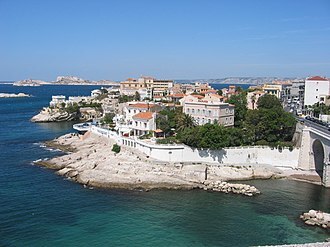 After five weeks only 19 survived due to disease and conflict with the Caribs, the French officially claimed the island in 1635. 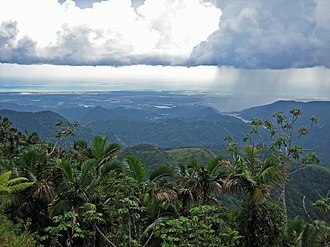 The English attempted the next European settlement in 1639, and that too was wiped out by Caribs, in 1643 a French expedition sent out from Martinique established a permanent settlement on the island. De Rousselan was appointed the governor, took a Carib wife. 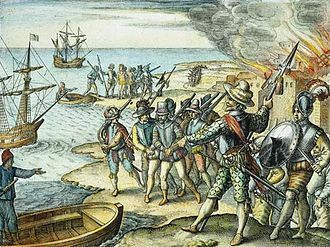 In 1664, Thomas Warner claimed Saint Lucia for England and he brought 1,000 men to defend it from the French, but after two years, only 89 survived with the rest dying mostly due to disease. Muslims constitute 5 percent of the population on Trinidad and Tobago, representing 102,421 individuals. 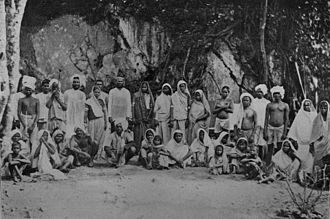 The majority live in Trinidad but there are a handful in Tobago as well, the first Muslims to arrive in the country arrived from Africa brought as slaves by the colonists. 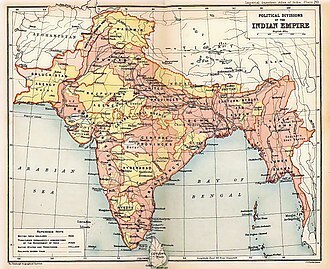 From the 1840s, Muslims came from South Asia as part of the Indian indenture system to work on sugar cane, Muslims today are mostly of South Asian descent but there are converts from all races. In Trinidad there are Islamic primary and secondary schools, the first Muslim secondary school in the country, ASJA Boys College, San Fernando, was established in 1960. There are many mosques and Eid ul Fitr is a public holiday, there are several mosques belonging to the Ahmadiyya Muslim Community. In 2005, an Islamic television channel IBN Channel 8 was born, in 2006 was Darut Tarbiyah The Islamic Network established. Jamaat al Muslimeen coup attempt Muslims in T&T - Trinidad Guardian, Indian Diaspora Supplement May 30,2000, national Library Archive The Trinidad & Tobago Masjid Project - comprehensive list of masaajid in T&T. Trinidad and Tobago cuisine is indicative of the blends of African, British, French and Spanish influences. Some other breakfast foods are Accra, Stew Chicken liver or gizzard, hashed browns with Vienna sausages and eggs is a breakfast combination made almost everyday throughout towns such as Diego Martin and Valsayn. Fried bake is usually served with saltfish, corn or smoke herring, bacon, fried plantain, stew chicken, or Corned beef with onions and tomatoes. Coconut bake is usually served with fried accra, black pudding, cheese paste, tannia cakes, callaloo is often served with cornmeal coo coo, cassava, sweet potatoes and curried crab. Pelau, a dish, is a very popular dish in Trinidad and Tobago, as well as stewed chicken, breadfruit oil down, macaroni pie, ox-tails. One of the most popular Trinidadian dishes is curried duck served with roti or rice. Local curried duck cooking competitions are held with multiple variations being created. A simple dish to make, but difficult to master, curried Muscovy is regarded as a delicacy which can be served at all times, fish broth a soup made in the style of Bouillabaisse is quite popular as a main dish or as a side. Tobago is particularly famous for its crab and dumplings. A popular Trini dish is macaroni pie, a macaroni pasta bake, with eggs and cheese, another local dish is the rare delicacy cascadu, which is a small, freshwater fish. The fish is curried and served with rice and cassava. There is a legend in Trinidad that s/he who eats cascadu will return to Trinidad to end their days. Also a special type of West Indian spaghetti dish is made in the towns of Chaguanas, Couva and it is made by using durum semolina, scorpion peppers, pasta sauce and a hint of garlic sauce. Everything is sauteed in a pan until all the fluid dries. It is served with salt dashed on top with some rosemary, trinidadians accompany their meals with various condiments, these can include pepper sauces and pickles and are often homemade. Pepper sauces are made by using habanero or other hot peppers, either minced or chopped and it can sometimes include lime or lemon as well as other vegetables, and come in many variations and flavors. The art form was most popularised at that time by Harry Belafonte. There are local communities which practise and experiment with classical and pop music. MusicTT was established in 2014 to facilitate the development and export activity of the music industry in Trinidad. The Cedula of Population of 1783 laid the foundation and growth of the population of Trinidad, the islands Spanish possessors contributed little towards advancements, with El Dorado the focus, Trinidads geographical location made it the center of that focus. Following the Cedula, French planters from the French Antilles of Martinique, Grenada and this exodus was encouraged due to the French Revolution. The Spanish gave incentives to lure settlers to the island, including exemption from taxes for 10 years. These new immigrants established local communities of Blanchisseuse, Champs Fleurs, Cascade, Trinidads population jumped from less than 1,400 in 1777, to over 15,000 by the end of 1789. In 1797, Trinidad became a British crown colony, with a French-speaking population, Carnival had arrived with the French. Official and elite unease over carnival revelry grew during the few decades. This injunction came after a disturbance during the 1881 Carnival. These canboulay processions were popular, and often incorporated kalenda, to make sure that the point got across, stick-fighting itself was banned in 1884. An ingenious substitute for the drums and sticks, called tamboo bamboo, was introduced in the 1890s, tamboo-bamboo bands consist of three different instruments, foulé, and cutter. The boom serves as the instrument, is usually about five feet long. The foulé, an instrument, consists of two pieces of bamboo, each about a foot long, and is played by striking these pieces end to end. The cutter, the instrument in the ensemble, is made from a thinner piece of bamboo and is struck with a stick. These three types of instruments combined to beat out rhythms that accompanied the chantwells and were a staple of carnival celebrations for many years and they were gradually rendered obsolete by the steel band. The 1930s saw contests between tents become a part of Carnival, and in 1939, Growling Tiger was crowned the first calypso monarch of Trinidad. The Caribbean is a region that consists of the Caribbean Sea, its islands and the surrounding coasts. The region is southeast of the Gulf of Mexico and the North American mainland, east of Central America, situated largely on the Caribbean Plate, the region comprises more than 700 islands, islets and cays. These islands generally form island arcs that delineate the eastern and northern edges of the Caribbean Sea, in a wider sense, the mainland countries of Belize, Guyana and French Guiana are often included due to their political and cultural ties with the region. Geopolitically, the Caribbean islands are usually regarded as a subregion of North America and are organized into 30 territories including sovereign states, overseas departments, and dependencies. From December 15,1954, to October 10,2010, there was a known as the Netherlands Antilles composed of five states. The West Indies cricket team continues to represent many of those nations, the region takes its name from that of the Caribs, an ethnic group present in the Lesser Antilles and parts of adjacent South America at the time of the Spanish conquest. The two most prevalent pronunciations of Caribbean are KARR-ə-BEE-ən, with the accent on the third syllable. The former pronunciation is the older of the two, although the variant has been established for over 75 years. 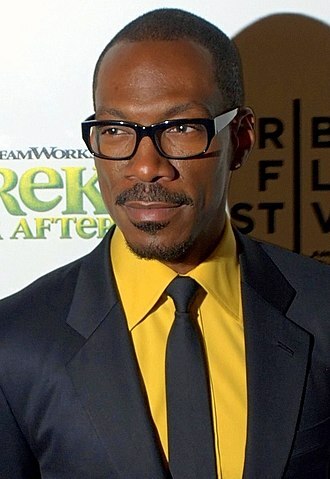 It has been suggested that speakers of British English prefer KARR-ə-BEE-ən while North American speakers more typically use kə-RIB-ee-ən, usage is split within Caribbean English itself. 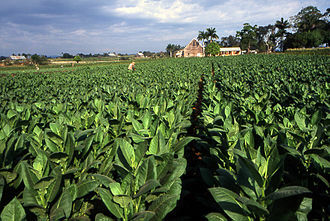 The word Caribbean has multiple uses and its principal ones are geographical and political. The Caribbean can be expanded to include territories with strong cultural and historical connections to slavery, European colonisation, the United Nations geoscheme for the Americas accords the Caribbean as a distinct region within the Americas. 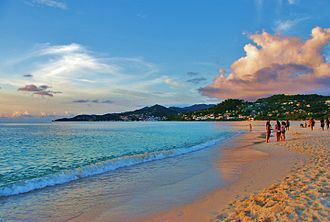 Physiographically, the Caribbean region is mainly a chain of islands surrounding the Caribbean Sea, to the north, the region is bordered by the Gulf of Mexico, the Straits of Florida and the Northern Atlantic Ocean, which lies to the east and northeast. 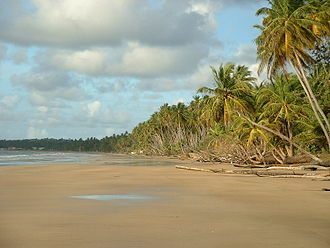 To the south lies the coastline of the continent of South America, the Caribbean may be centred on socio-economic groupings found in the region. Caribbean literature is the term generally accepted for the literature of the various territories of the Caribbean region. Most of these territories have become independent nations since the 1960s and they all share, apart from the English language, a number of political and social ties which make it useful to consider their literary output in a single category. 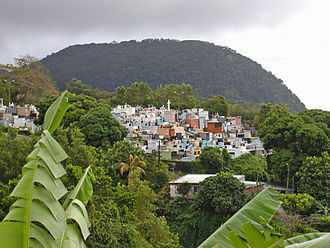 S. Virgin Islands would normally be considered to belong to the category of West Indian literature. Some literary scholars might include Bermuda, though geographically Bermuda is not part of the Caribbean and cultural ties with the region are not very strong. Magazines such as Kyk-Over-Al in Guyana, Bim in Barbados, and Focus in Jamaica, critics in their adopted territories might argue that, for instance, V. S. One unique and pervasive characteristic of Caribbean literature is the use of forms of the national language. Many Caribbean authors in their writing switch liberally between the local variation - now commonly termed nation language - and the form of the language. This article discusses systems and effects of slavery within Africa. 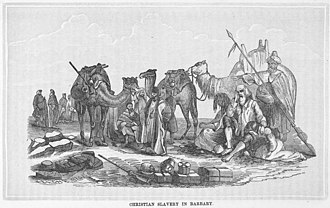 See Arab slave trade, Atlantic slave trade, Slavery in Africa has existed throughout the continent for many centuries, and still continues in the current day in some countries. 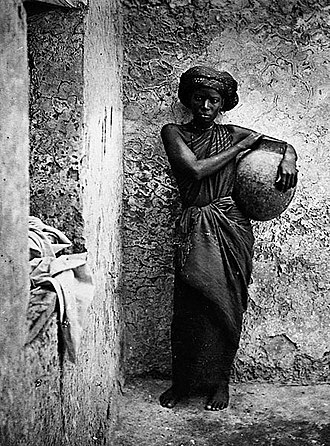 Systems of servitude and slavery were common in parts of the continent, when the Arab slave trade and Atlantic slave trade began, many of the local slave systems changed and began supplying captives for slave markets outside of Africa. Slavery in historical Africa was practiced in different forms, Debt slavery, enslavement of war captives, military slavery. Slavery existed in parts of Africa and was a part of the structure of some societies for many centuries. 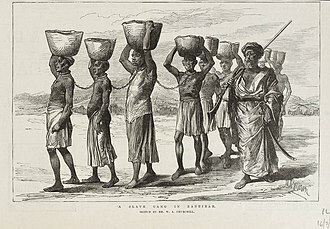 In sub-Saharan Africa, the relationships were often complex, with rights and freedoms given to individuals held in slavery and restrictions on sale. Many communities had hierarchies between different types of slaves, for example, differentiating between those who had been born into slavery and those who had been captured through war, the forms of slavery in Africa were closely related to kinship structures. 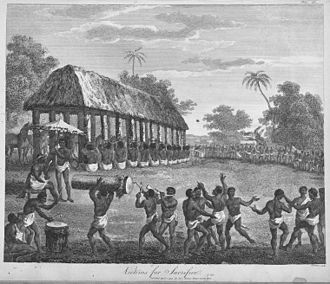 In many African communities, where land could not be owned, enslavement of individuals was used as a means to increase the influence a person had and expand connections. This made slaves a permanent part of a lineage and the children of slaves could become closely connected with the larger family ties. Children of slaves born into families could be integrated into the kinship group and rise to prominent positions within society. However, stigma often remained attached and there could be strict separations between slave members of a group and those related to the master. Chattel slavery is a specific servitude relationship where the slave is treated as the property of the owner. As such, the owner is free to sell, trade, or treat the slave as he would other pieces of property, many slave relationships in Africa revolved around domestic slavery, where slaves would work primarily in the house of the master but retain some freedoms. Domestic slaves could be considered part of the household and would not be sold to others without extreme cause. Nativity scene in Scarborough, Tobago, Trinidad and Tobago. Divali Nagar in Chaguanas, Caroni County, Trinidad and Tobago. Diyas lighting on Divali night in Trinidad and Tobago. 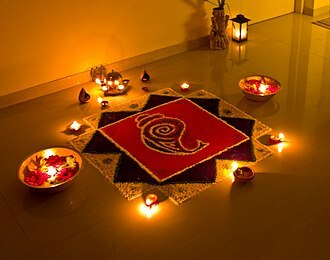 Rangoli decorations, made using coloured fine powder or sand, are popular during Diwali. Diwali is celebrated in the honour of Lakshmi, the goddess of wealth. Annakut community meals (left), Krishna holding Govardhan ritually made from cow dung, rice and flowers (right). Holi snacks and drinks, post play with colours. Left: salty snacks, Middle: Gujia (a stuffed wrap), Right: Thandai (almonds-based chilled drink) to which sometimes intoxicating "bhang" is added. A Mosque in Montrose, Chaguanas. Temple in the Sea historical marker. Seepersad Naipaul, father of V. S. Naipaul, and the inspiration for the protagonist of the novel, Mr Biswas, with his Ford Prefect. The flag of Trinidad and Tobago flying at the San Fernando Hill, San Fernando in July 2009. The Hanuman Temple at Carapichaima. An indenture signed by Henry Mayer, with an "X", in 1738. This contract bound Mayer to Abraham Hestant of Bucks County, Pennsylvania, who had paid for Mayer to travel from Europe. Robert Antoni at the 2013 Texas Book Festival.